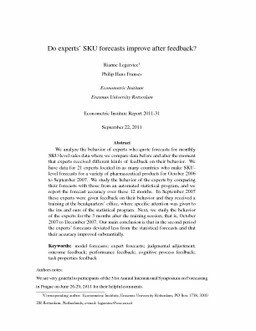 RePub, Erasmus University Repository: Do experts' SKU forecasts improve after feedback? Do experts' SKU forecasts improve after feedback? We analyze the behavior of experts who quote forecasts for monthly SKU-level sales data where we compare data before and after the moment that experts received different kinds of feedback on their behavior. We have data for 21 experts located in as many countries who make SKUlevel forecasts for a variety of pharmaceutical products for October 2006 to September 2007. We study the behavior of the experts by comparing their forecasts with those from an automated statistical program, and we report the forecast accuracy over these 12 months. In September 2007 these experts were given feedback on their behavior and they received a training at the headquarters' office, where specific attention was given to the ins and outs of the statistical program. Next, we study the behavior of the experts for the 3 months after the training session, that is, October 2007 to December 2007. Our main conclusion is that in the second period the experts' forecasts deviated less from the statistical forecasts and that their accuracy improved substantially.